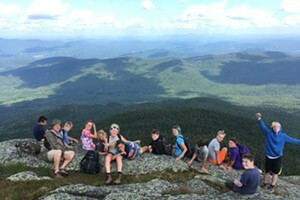 Got It Covered | Project | Kids VT - small people, big ideas! As kids' textbooks begin piling up in lockers and backpacks, here's a new twist on a classic method of protecting them. 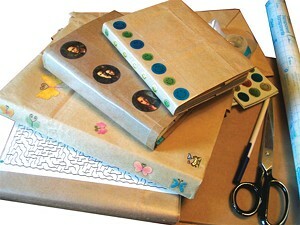 Recycle paper grocery bags to make book covers using the tried-and-true method described below. Then place comic strips, pictures of favorite pop stars, meaningful quotes or helpful hints on the cover and encase it in contact paper, making the cover more memorable — and durable! Add schedule reminders or other useful information on the inside flaps. Contact paper even works as a dry-erase surface. Draw a tic-tac-toe or hangman board on your book covers and you've got a little extra entertainment in your bag. Just don't do it during class. Cut along one seam of the paper bag, from the opening to the bottom of the bag. Cut the bottom off, leaving one long rectangle of paper. To estimate how long the cover needs to be, set your book on the paper fold one end onto the book and around to the inside of the front cover. Allow the paper to overlap about two-thirds of the length of the inside cover. Mark the paper with a line at the spine of the book; this is the mid-point of the cover's length. Remove the book and fold the paper at the line. Trim the excess paper, so that you have two equal halves, with the fold in the middle. To make the cover the correct height, place the book on the paper and mark the top and bottom edges of the book. Fold along the length of the paper at the marked spots to create creases at the top and the bottom. Set the book on the paper and fold the front cover flap over the front cover. Then insert the edges of the cover into the slots at the top and the bottom of the inside flaps. Repeat this step for the back cover. Once the cover is done, clip your favorite cartoons or other decorative elements and place them on the cover. Put a small piece of tape folded into a barrel on the back to hold them in place. Cut a piece of contact paper large enough to cover the decoration, remove the backing, and stick it on.